My last three posts have been focussed on my first foray into First Lego League and the students involved. 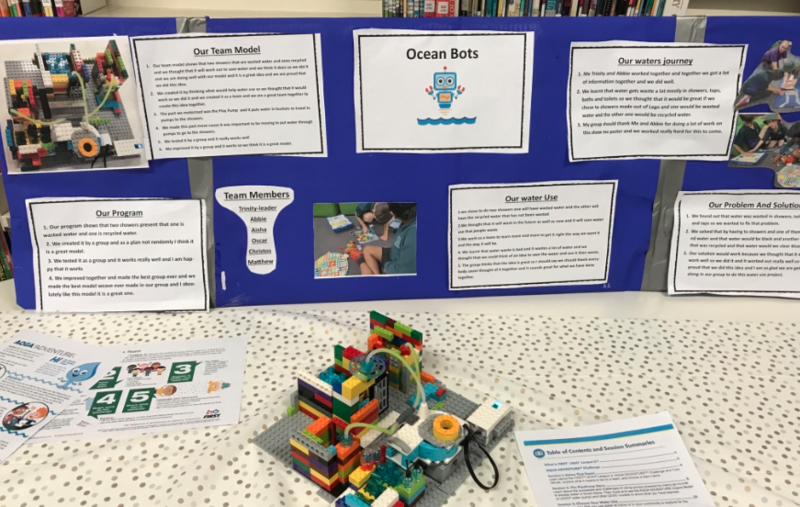 But together with my fellow AP, Nicola, we also decided to get started with First Lego League Junior this year to broaden STEM enrichment offerings at Prospect North, and to cater for younger students. Nicola had heard about the program before so I decided to do some research. 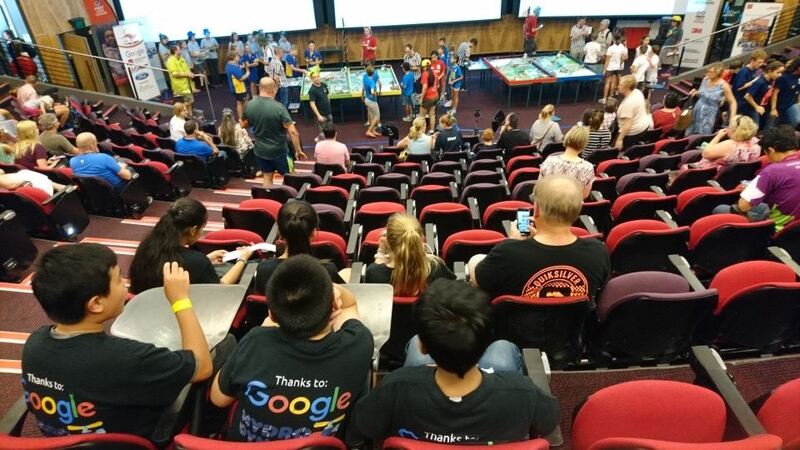 First Lego League has been operating in Australia since 2006 (worldwide since 1999) but its younger cousin is much newer (worldwide since 2007) and seems to have been available in Australia for a few years. 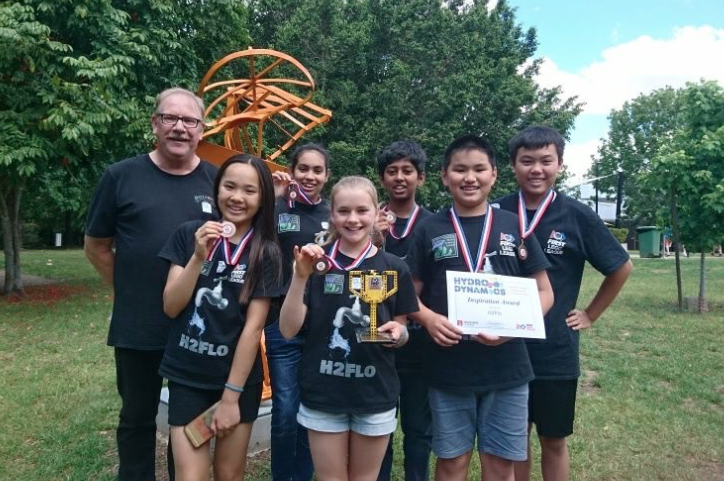 And while there were three regional tournaments for FLL available here in South Australia, there were no official Expos planned for this state. 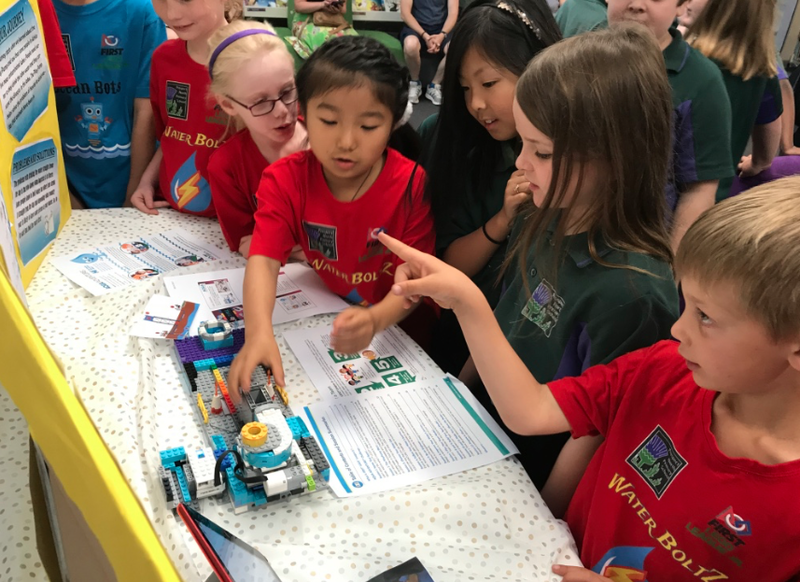 Focused on building an interest in science and engineering in children ages 6-9, FIRST® LEGO® League Junior is a hands-on program designed to capture young children's curiosity and direct it toward discovering how science and technology impact the world around them. This program features a real-world challenge, to be explored through research, critical thinking and imagination. Guided by adult coaches and the Core Values, team members work with LEGO® elements (LEGO WeDo Kit) and motorized parts to build ideas and concepts and present them for review. Each yearly Challenge is based on a different theme and has two main parts, the LEGO® Model and the Show Me Poster. Build a LEGO® Model based on the Challenge instructions that contains both a simple machine and a motorized part. The culmination of the hard work for many teams is the participation in an expo event ... Volunteer Reviewers at the event interview the teams to learn about their LEGO® Model and Show Me poster. All the teams are celebrated and leave with an award. I had bought Lego WeDo 2.0 kits for the school as one of my first investments from the STEM budget and worked across the Year 2 - 4 classrooms to give students the opportunity to use this very hands on technology. FLL Jr is tied to the use of WeDo - and so together, Nicola and I decided to offer this opportunity to four teams of students from ages 6 - 10. We started by asking the Digital Leaders who might be interested, and then asked the Year 1 teachers to nominate a student who would benefit from the experience. I ordered four team Inspiration Model kits which are part of the year's program. 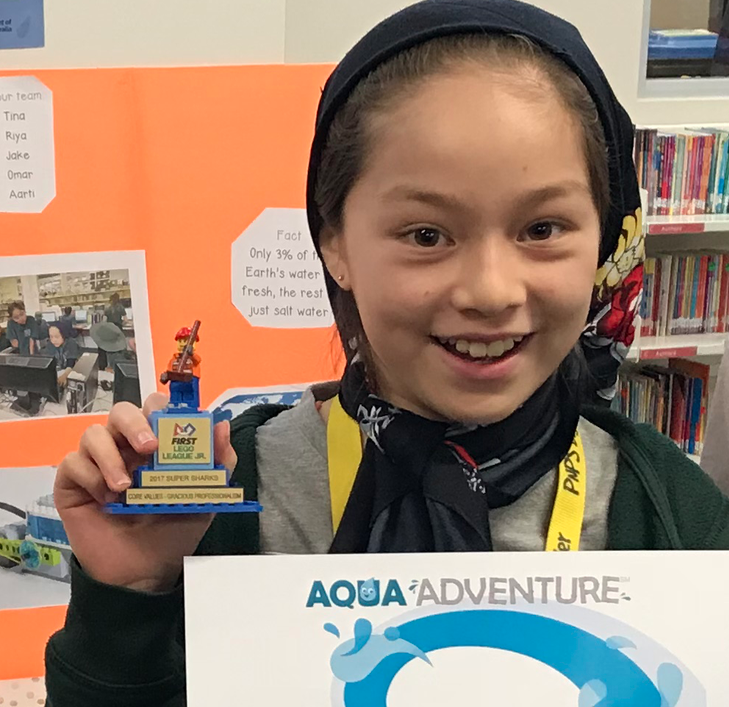 This year's theme was Aqua Adventure, which ties in with the FLL's HydroDynamics theme. The kits were ordered from Macquarie University and cost $20 each. When I looked online to find out a bit more about the kit, I was very pleased to see that each kit had over 700 pieces! Lego are a bit like Apple in that they don't really do discount on their products so these kits represented phenomenal value. When I told my principal, her first reaction was to ask, "How many of these kits can we order?" Schools can always use more Lego. 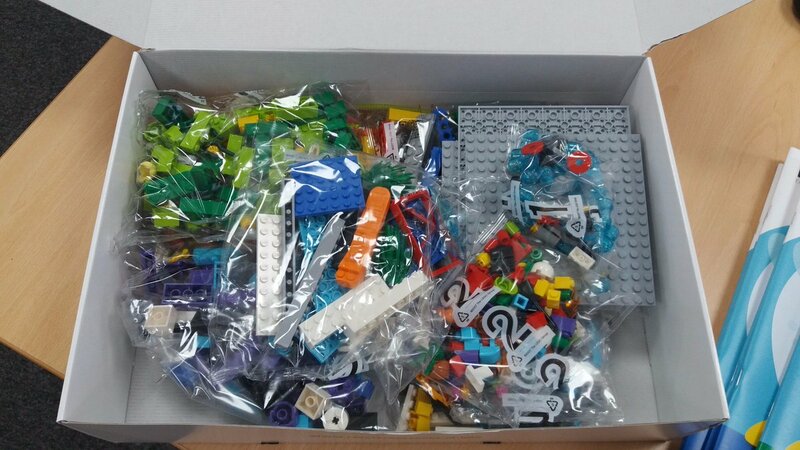 This much Lego for $20! There is also an Engineering Notebook that is given out to students in the US but it raises the costs of registration significantly. Here in Australia, participating coaches could access the Notebook via a download link which I cannot share here. The Notebook was a great scaffolded learning journey that Nicola and I used as a blueprint with the students, covering ideas like the PlayPump™ and getting kids to use Lego to engineer concepts along the way on the them of human water use. 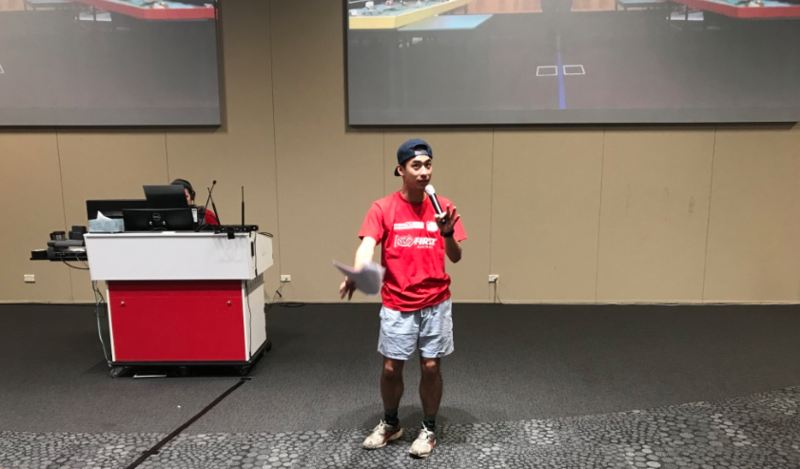 The four teams gave themselves theme based names and we nominated Year 4 students as leaders to keep the mixed gender and year level teams on track. These leaders helped to design the team t-shirts which also helped build the excitement as we worked our way through the ten week program. We decided to hold our own local Expo with the goal of expansion in 2018 once we felt like we knew what we were doing. With a few weeks to go and while balancing the responsibilities for the Hydrodynamics teams and a school commitment to hosting a Kids Teach STEM conference for our local partnership schools, we nailed down an Expo date. The teams worked towards this by typing up what they had learned and displaying it on large ShowMe posters. The working models were constructed - even though they did not approach the scale and complexity of what we could see online. Nicola and I worried about our standards not being as high and the students' work needing more depth but in the end, the students did a commendable job considering how much time they were given and that this was a brand new process for everyone and no one really knew how it would all turn out. The models had to demonstrate a solution to a water based problem for humans. One team looked at how to decontaminate water, one looked at recycling water for showers and other non-drinking purposes, another two showed how to filter household water out to a garden or other purposes. So, the day after the Kids Teach STEM Conference, we gathered in the library for our initial FLL Junior Expo. The four teams were dressed in their various coloured t-shirts and stood proudly by their displays. I had some small Lego based trophies for Awards out on display - the rules state that each team must win an Award if awards are given. I had the team names on lego blocks that were to be added as the Awards were determined. More parents than expected came along for the introduction and I even made contact with a grandparent who was a retired engineer who was full of praise for the event and offered to be of service to our school with possibilities of STEM mentoring in 2018. After parents and classmates had a good look, it was time for the teams to be reviewed. Marg, our principal and Phil, our retired Scientist in Residence did the reviewing and some senior FLL students ran a Core Values activity and a Guess The Famous Lego Minifigure quiz for teams while they waited. We then held our Closing Ceremony with certificates for all participants via the traditional High Five Line, and the trophies were awarded to each team. Check out my custom Lego trophy in the student's hand! Posted in Future Directions, Learning, Making, STEM on December 20, 2017 by Graham. In the past I think I have mentioned that I haven't always been that interested in robots, or even coding for that matter. On a personal level I just struggled to be interested in learning about then, even though on a professional level I knew it was important. In the previous few years at Woodville Gardens I was spoiled to have a talented teacher, Mel, on board who was super keen in this area and single-handedly got the school's Lego Robotics program off the ground. My contribution was limited to signing off on the purchases from the budget and coming along to a RoboCup event in 2015. 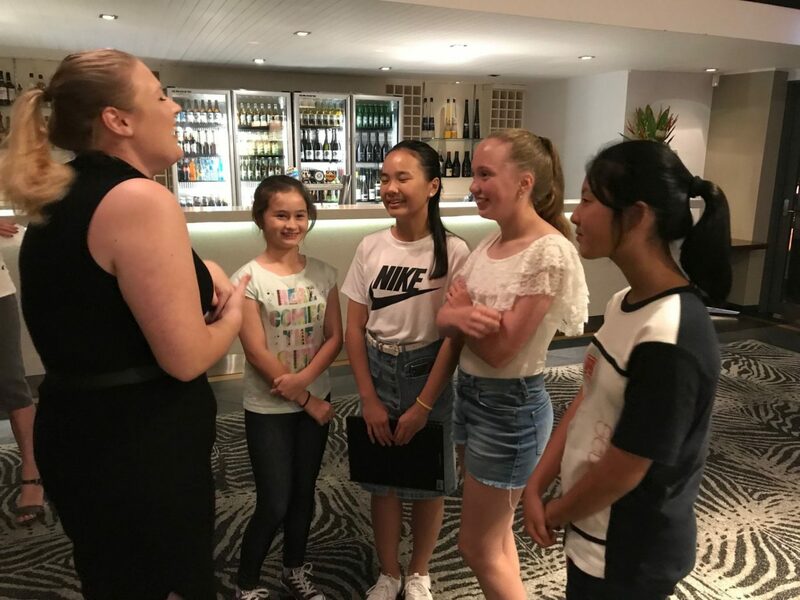 I checked in from time to time to see how she was going with the students and thought that entering teams in the First Lego League was a great idea but I didn't really step up and really find out exactly what was involved. Which was to my detriment - one of my few professional regrets of the last few years. But it was a testament to Mel's talent and drive that she didn't come looking for my support or help. Her efforts were rewarded at the 2016 Regional day where her team won the Research Project trophy. Fast forward to this year and I stepped into a new role as Assistant Principal - STEM at Prospect North Primary. 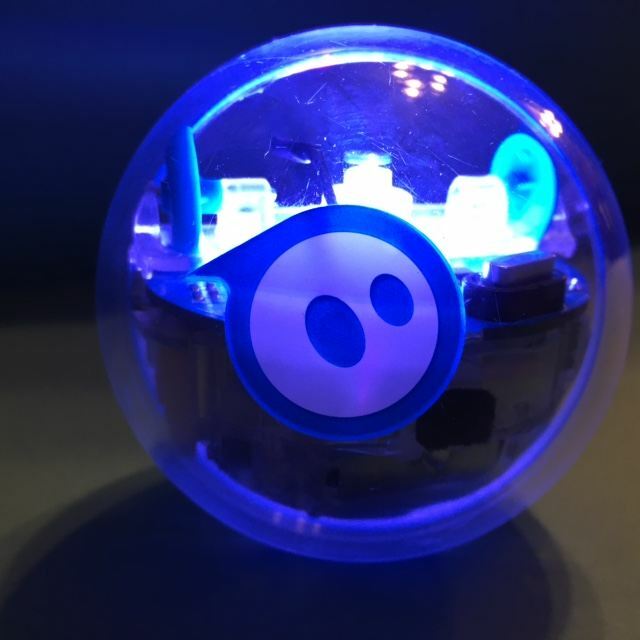 My principal, Marg (who in her own words is a "fellow techhead") described my role as getting a lot of technology programs up and running to really widen opportunities for the students, and hinted that I might want to get a First Lego League program up and running. And so away I went on a whirlwind journey that would progress way beyond my own expectations. 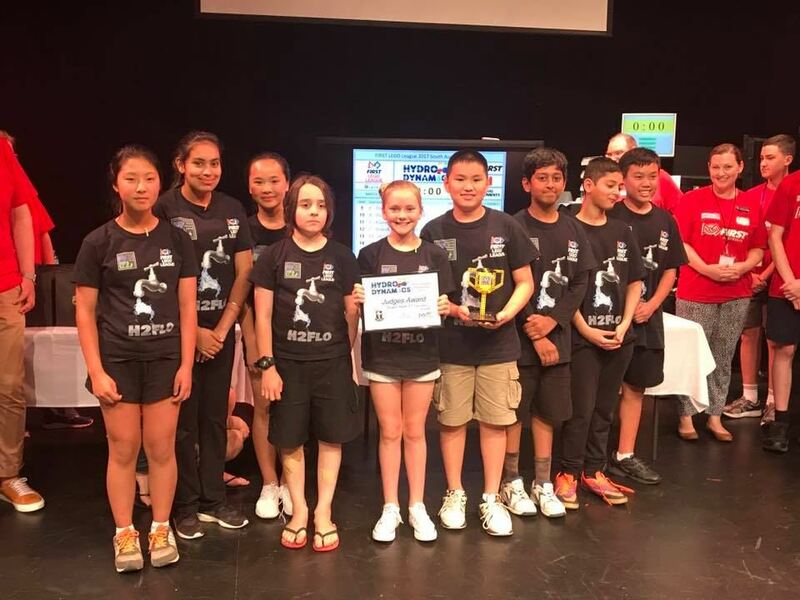 Not content with just learning how to be a rookie coach in a new-for-me venture, my fellow AP Nicola and I also decided to get involved in First Lego League Junior, a first for the school and indeed as it turned out a first for any school in this state. But that's another story for another post because as successful as FLL Jr was for our first go, it was still contained within our own expectations. And unlike how I left Mel by herself at WGS, Nicola was an equal driver of this program. But on the FLL front, it was just me to get it all up and running. I called a meeting of interested students from Year 5 to 7, and had just over twenty keen potential participants come along. Trying to be inclusive and democratic, we decided to form two teams of ten with a couple of reserves should anyone find it wasn't for them. At that stage, I wasn't even sure it was for me either! I gave them the option of forming their own teams and one group quickly formed around two friendship groups and a connection between twins. This team became Splice Cubes. The other team was a mixed bag of students who didn't really know each other that well - the only common factor was that they were interested in pursuing this whole venture further. And interestingly, when teams meant that one person had to be a reserve, a Year 7 boy called Jimmy volunteered to be that person because he "didn't want anyone else to miss out." This is retrospectively interesting so remember the name as this post rambles along. 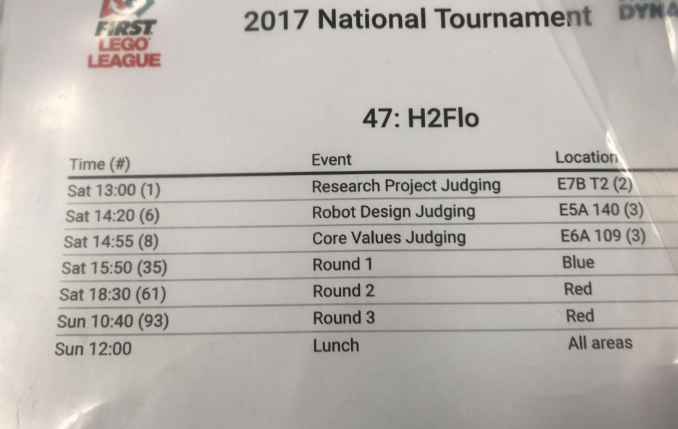 This team decided to name themselves H2Flo. I had ran lessons with the upper primary classes using our newly purchased Lego Mindstorms EV3 robot kits but felt like I was only just a step or two ahead of the students. 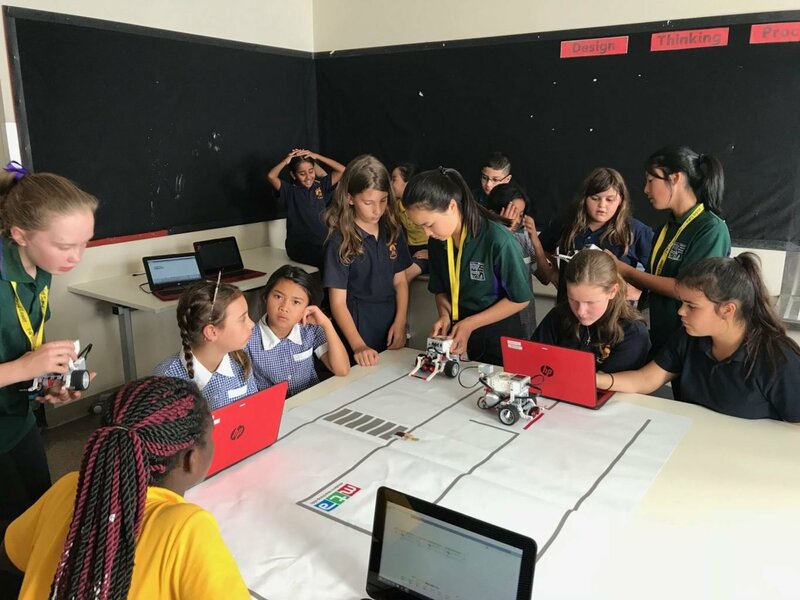 A quite a few of the talented and keen kids who had signed up for FLL grasped the concepts of Mindstorms coding quickly and moved quickly past my expertise to figure a lot of stuff for themselves. Again, it is important for teachers to realise that they don't have to expert in everything but affording the students the opportunity to learn for themselves and not be constrained by their teacher's limitations. I tried to operate with that mindset throughout this whole journey, trying to relay information as required for them to get to their goals efficiently. For any readers not familiar with Lego League, the deal is something like this. You can have a team of up to ten students aged 9-16 and they have several tasks that they must prepare for in order to compete at a Regional Championship. Every year, Lego have a new theme based around a social human issue - previous years have looked at rubbish, senior citizens and human interaction with animals. This year's theme was HydroDynamics and was focussed on human use of water and associated problems. 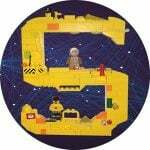 The Robot Game is a large mat with Lego constructed missions that an EV3 based robot must undertake in order to score points within a two and half minute Game. The team must also prepare a Research Project presentation that must take no more than five minutes in front of judges, and it must offer a unique solution to a problem identified that ties in with the season's theme. 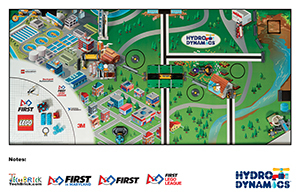 At the Championships, there is also a Robot Design section and a Core Values activity that the team does not get to see until the day. The August launch date for the new season loomed quickly and we ordered a custom built practice table from the carpenter partner of Jasmin, one of our Reception teachers who had worked with Mel in 2016 with the Woodville Gardens team in their successful Animal Allies foray. This table is a thing of beauty - so nice we have resisted the urge to paint it and left in its natural unvarnished state. After a quick online application I registered both teams and scored some sponsorship from Google who paid for our registration, the cost of the game kit and a new EV3 kit. This is part of Google and Lego's commitment to try and encourage schools from a disadvantaged background to get involved - for us, it was much appreciated. It didn't take long for the game kit to arrive and I got both team to unpack and build the Lego models for the game mat that fitted into our practice table. There was a model toilet that triggered a water treatment plant when flushed, there were water pipes that needed replacing, a well to push into place, a fountain and flower that needed "big waters" and other models that required the robot to lift, push, move or carry to complete successfully. These models were placed or locked into place with velcro like tabs and the students could start planning for their robot games. Both teams decided to build robots based on the EV3 booklets and decided not to include infrared or colour sensors as our fast tracked learning curve had not allowed time to get particularly competent in their use. Each team met and allocated roles so that the Research Project would not get neglected but as they had not participated before or seen this before, they were unsure of how the whole thing should look and be structured. And because I had neglected to take a close look at Mel had done it with her teams, I was only guessing with my own advice. After a while, a small group of girls from the Splice Cubes team started asking me if I could supervise them during their breaks as they felt they were getting somewhere with their coding. They designed attachments and modified their robot in an effort to get consistency when they "launched" it out to tackle a mission. They analysed the game mat and planned which missions were within their reach as rookies, and worked towards those goals. The other team were more sporadic in their break time visits and seemed to have a rotating roster of students who were looking at their coding. Their robot was less sophisticated and they were in awe of how far in front the Splice Cube students were in comparison. Once the whole gamut of expectations were unveiled and regular meetings at break times, we had a couple of kids decide that it wasn't for them and this opened up the opportunity for a reserve to join in. This was fortunate for H2Flo as Jimmy was able to participate fully and share his coding and strategic skills with the team. It was about that time that I went to FLL training run by Concept2Creation who run the FLL events here in Adelaide. They had referees and volunteers from the community team RoboRoos there and I learned a lot of key information that was invaluable. One comment that stuck in my mind was that is not unusual for a rookie team to have a Robot Game where nothing goes right and scores a 0. So, don't be concerned - if your team can get your robot to score anything then that counts as a success! That was a great message to take back to the students. At the end of Term 3, I realised that there were only 4 weeks to go before our Regional at Novar Gardens in mid November. We met with the teams and checked on their projects and Game progress. 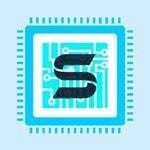 Splice Cubes were looking promising with their robots but had still to get going on their Research Project and were still even to identify a problem to solve. Meanwhile to my surprise, H2Flo were quietly well advanced in their research showing me a draft script and a prototype 3D design, but their robot game efforts were a batch of individually developed mission coding strings sitting on four to five different laptops. We resolved to have every break time available to either team to work on their priorities, and I negotiated an extended release time from regular lessons for the students. One of the guidelines of FLL is that teachers/coaches are there to help but the students do all of the work - I made sure that was the case resisting the adult urge to meddle and give them "better ideas". We had team t-shirts designed and ordered so that we would look just like those teams we could see on YouTube videos of American FLL events. At $20 a student, they were a great investment in team spirit. The November 19 Regional was rushing up at us. There was panic, apprehension and excitement in equal measures. Media release forms were signed and returned and the two teams were as ready as any team who doesn't really know what they have signed up for looks like. Would the whole experience live up the expectations we had in our own minds? We were about to find out. Posted in Programming, STEM on December 8, 2017 by Graham.